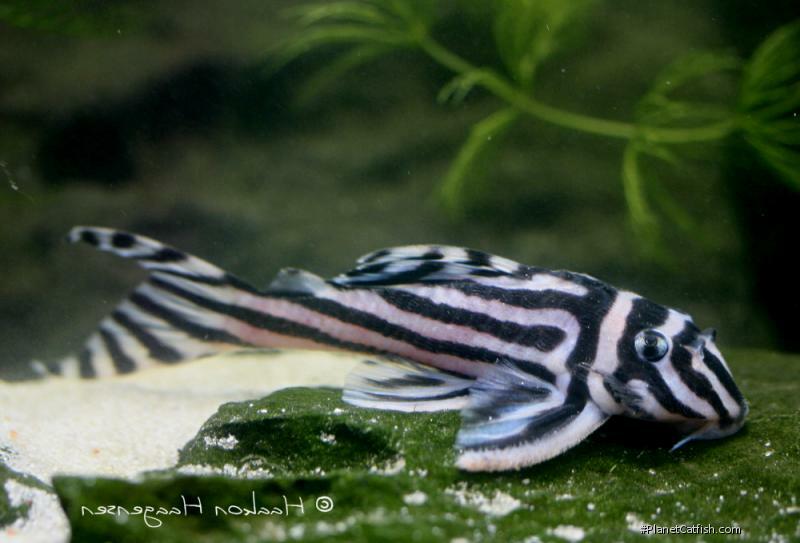 Zebra Plecos - if the internet has adopted a catfish, then it is this fish. So much is written online about this enigmatic catfish that it is hard to assimilate accurately. 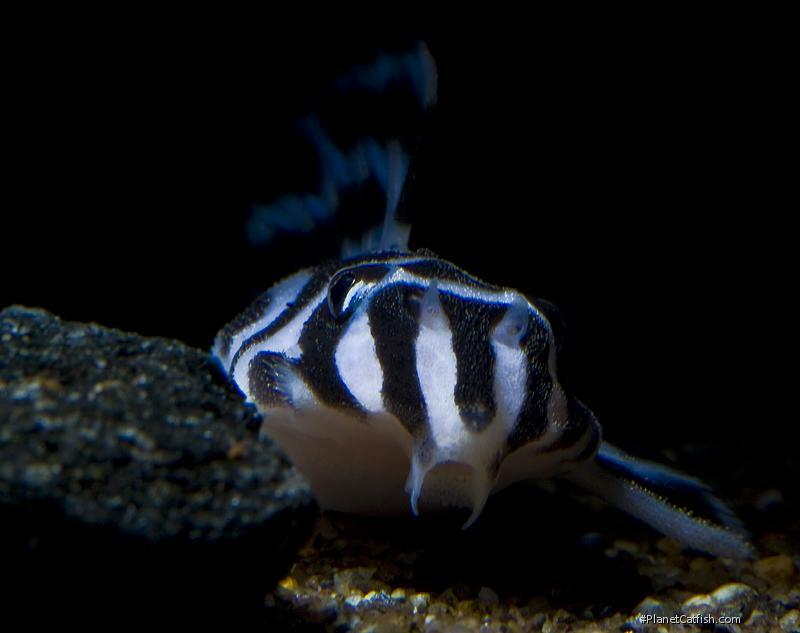 Going back in time, when this fish appeared I couldn't believe that a Loricariid could exist with such a striking appearance. I also couldn't believe the £200 price tag for the first one sold in Scotland (as an "Imperial Peckoltia") The Imperial common name still exists in the far east, but is not now commonly used in the West since the fish was assigned its scientific name by Isbrücker & Nijssen. Eventually the price came down and I ran out of excuses not to buy one. I built this up over time to a trio and I still stare in disbelief at these most magnificent catfish whenever I see them. If it were not for their obvious heritage, I would swear I was looking at a Marine Reef Tank. Once settled, Zebras are erratically active during the day and will come out on brief excursions from their chosen refuge. They are not algae eaters, may munch the occasional cucumber slice or lettuce leaf but much prefer sinking tablets or their favourite: bloodworms". Forshey J. 1996, A visit to Brazil's Rio Xingu. TFH. May: 22-28. 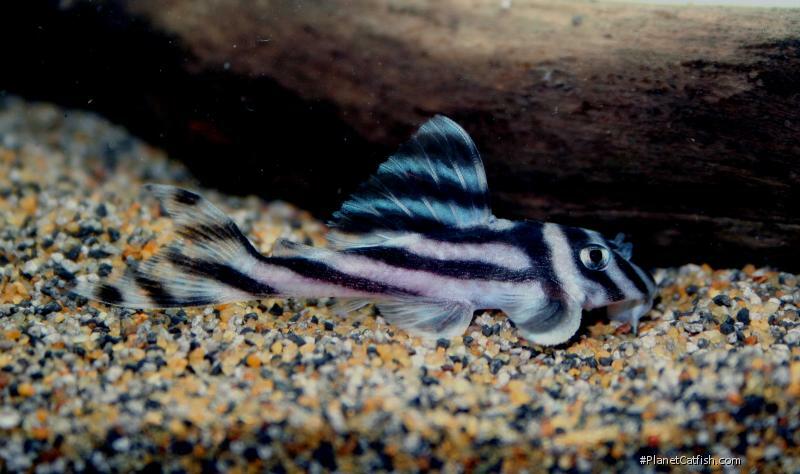 Hypancistrus zebra, a new genus and species of uniquely pigmented ancistrine loricariid fish from the Rio Xingu, Brazil (Pisces:Siluriformes: Loricariidae) . Isbrücker & Nijssen 1991. Ichthyological Exploration of Freshwaters, Vol. 1 No. 4 pp.345-350. A large, mature adult male, note the lightly faded colouration and thickended pectoral fin spine.